Growth rates for the Software as a Service business model are inspiring high. You can just check the astounding Dropbox 3900% growth over 15 months, reaching over $1 billion in annual revenue run rate in 2017. Or Slack’s 63% paid seat growth in 5.5 months. Or Zendesk’s dollar-based net expansion rate of 115% during the fourth quarter of 2016. But SaaS companies need to grow at these impressive rates. Unlike companies in other industries, which would happily welcome a 20% annual growth, a software company growing at 20% annually has a 92% chance of extinction within a few years. 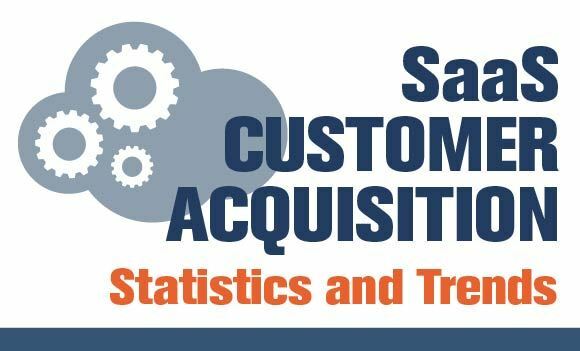 To help you benchmark your marketing efforts and focus points in driving growth, our new infographic on SaaS Customer Acquisition brings the top growth activities for SaaS business, the most commonly tracked metrics, as well as the investments on customer retention. You will also find out that not requiring a credit card for sign-up generates double the customers from free trials. The likelihood of a trial user becoming a paying customer increases as well, by 70%, when sales reps contact the users. 89% of SaaS businesses treat “New Customer Acquisition” as their highest growth priority followed by 59% who treat “Existing Customer Renewals” and 46% who treat upselling and add-on sales as high priority. SaaS companies that allow sign-ups without a credit card generate twice as many paying customers from their free trial. Active trial users that are contacted by a sales rep are 70% more likely to buy the paid service than those that aren’t. 52% of SaaS companies increased their spending on customer retention last year.